They said it would all be over in a few weeks: the blockade, the food shortages, the power cuts. It's been over six months. They said everything would be all right, but I can only see things getting worse, and there is something out there in the darkness. It's getting harder to deny, and even harder to ignore. I don't know what to do. There is nowhere to run, nowhere to hide. The shadows are hungry and I can see them everywhere. They whisper that I am a Potential, that I have the power to make things right. But all I know is that when I stare into the darkness, something deep within is staring back. 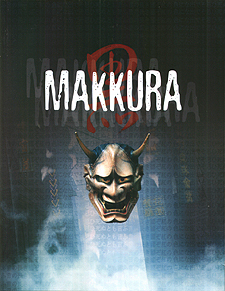 Makkura is a campaign of six full adventures for Kuro, the roleplaying game of near-future Japanese horror. Each adventure is linked together with several additional scenarios, takes you to the next level of the Kuro saga. Secrets will be revealed, spirits awoken and terrible enemies will prowl the streets of Shin-Edo. The Kuro incident was just the beginning. Listen to the Divine Wind that thunders against the Japanese archipelago: "The time of destiny has come. When the Red Storm rises, you must make a choice - to live or to die..."